Maliki’s focus on winning Shiite votes effectively turned the 2014 election into a contest among competing Shiite groups, most notably the Islamic Supreme Council of Iraq (ISCI, المجلس الأعلى الإسلامي العراقي‎), headed by Ammar al-Hakim, and the Sadrist Movement (التيار الصدري), headed by Muqtada al-Sadr, the former militia leader who returned to Iraq after four years of self-exile in Iran (and who, ostensibly, made a fuss earlier this year over his ‘retirement’ from Iraqi politics). Middle Eastern experts believed that it was possible for the Sadrists and ISCI to win more seats, in aggregate, than the State of Law Coalition, thereby allowing Hakim to become Iraq’s next prime minister. With 57 seats in total, the two groups will pose less of challenge to Maliki, who will now seek build a new coalition — either another national unity coalition or a majoritarian coalition. In either case, Maliki will almost certainly lead a government united not by an ideological agenda, but based upon dividing the perks of government. There’s still a possibility that the anti-Maliki Shiite groups could form a government with the support of the Kurdish and Sunni blocs, but that seems unlikely, given Maliki’s strength. Allawi, whose coalition crumbled over the course of the last four years, will now lead a bloc of just 21 seats under the banner of his longtime party, the Iraqi National Accord (الوفاق الوطني العراقي). The major Kurdish parties together won 62 seats. The Kurdistan Democratic Party (KDP, پارتی دیموکراتی کوردستان), whose leader Masoud Barzani (pictured above), currently serves as the president of the Iraqi Kurdistan region, won 25 seats. Its longtime rival, the Patriotic Union of Kurdistan (PUK, یەکێتیی نیشتمانیی کوردستان), whose leader Jalal Talabani currently serves as the largely ceremonial president of Iraq, won 21 seats. 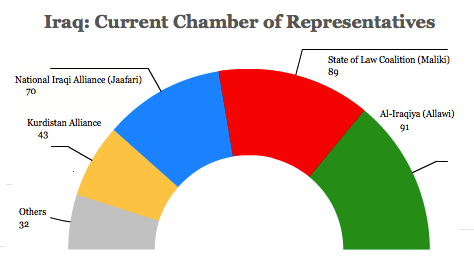 That’s a somewhat strong showing for the PUK, which suffered in last September’s Kurdish regional elections, not least because of Talabani’s health problems. In last year’s regional elections, the newly formed Gorran (Movement for Change, بزوتنه‌وه‌ی‌ گۆڕان‎‎) emerged in second place. But Gorran won just nine seats in the national elections this spring, something of a setback for the promising Kurdish reform movement. The results have cleared the way for a Kurdish regional coalition between the KDP and the PUK — regional leaders had been waiting for the national results in order to form the new regional government. Kurdish leaders are now pumping 100,000 barrels of oil a day directly to Turkey, angering Maliki and Iraq’s central government, which has tried to maintain national revenue-sharing for established oil reserves. Maliki earlier this year suspended the Kurdish allocation of the national budget, which amounts to 17% of total spending, and Kurdish politicians and entrepreneurs are working to develop more of the region’s oil wealth. Foreign investors are showing greater enthusiasm for development in Iraqi Kurdistan, which is largely stable. Though the Kurdish regional government isn’t immune to corruption, it’s generally far more effective than Iraq’s national government. 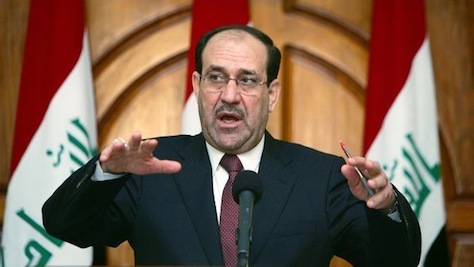 Maliki faces an increasingly bitter fight in his third term with Iraq’s Sunni population, whose participation in the April national elections was limited. In some parts of the country, it was simply too dangerous to hold elections; in other parts of the country, Sunni Iraqis shunned a contest largely seen as dominated by Shiite politicians. Sunni leaders, once prominent in the Maliki government, have been displaced by Shiite officials. Most notably, Maliki’s government forced order vice president Tariq al-Hashemi to flee Iraq after charging him with murder and sentencing him to death. Despite the tumult in al-Anbar province, it will still send 15 legislators to the Iraqi parliament, many of whom are moderate Sunnis. Maliki photo credit to Muhannad Fala’ah / Getty Images. 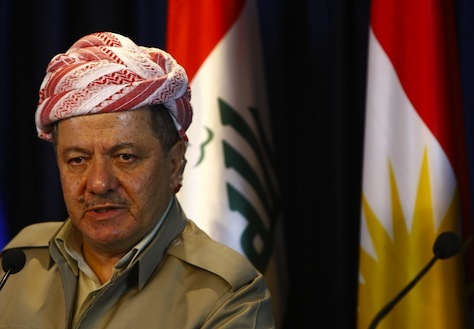 Barzani photo credit to Safin Hamed / Getty Images.